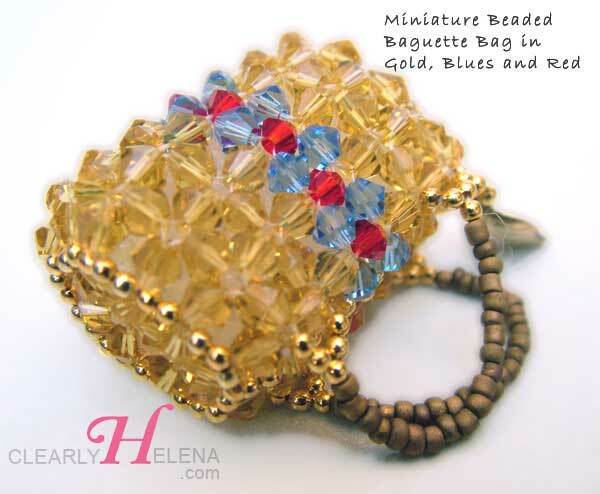 As handmade fashion accessories go, these tiny beaded bags are delightful, fun, and sassy! 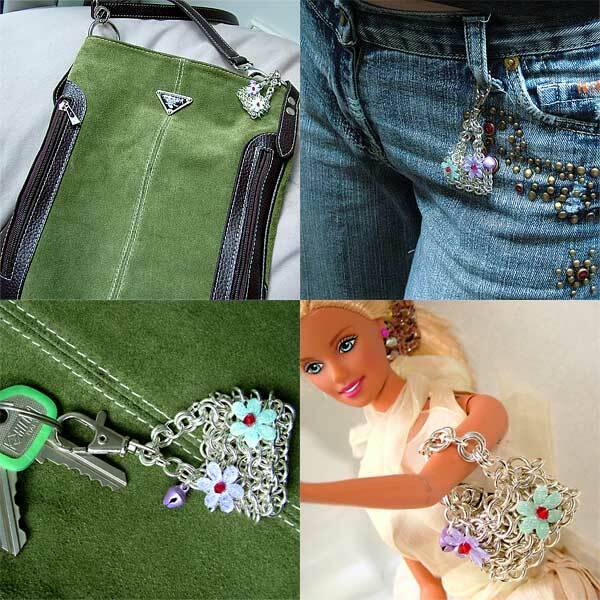 Ideal for your Barbie doll on her jaunts and carefree outings. 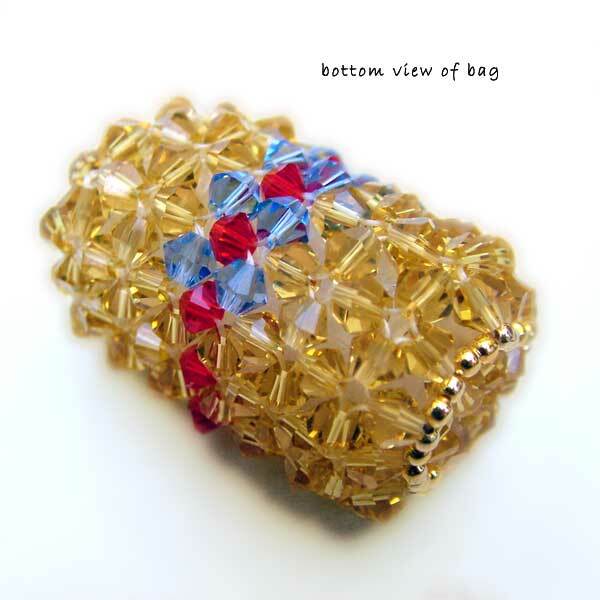 Can also be easily modify as a bag charm or key ring charm. I have used the coin in the above photo as a means of comparative sizing. The coin is equivalent to 1 Euro, 1 Australian dollar, or 1 GBP. 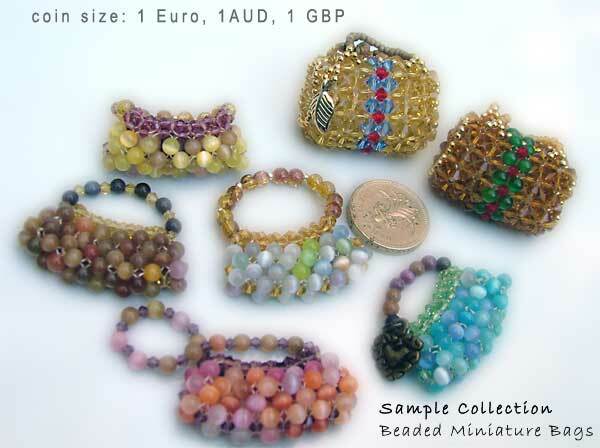 These miniature beaded (or chain mail) bags can easily be converted to handbag charms, jeans charms, or key ring accessory. Below are some illustrations of possible uses. Baguette bag is a small, long, narrow bag resembles shape of Baguette.with a shoulder strap, carried under the arm. 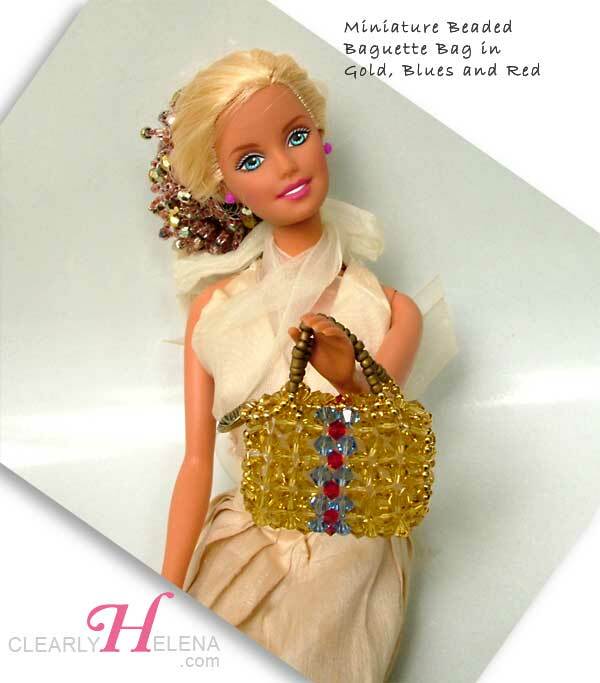 I have made Barbie model for us to show how classy she looks with her new beaded baguette bag/fashion accessory. Remember though that a full size friendly human can, with minor modifications, convert this into a jeans fashion accessory, a bag charm, or even a key ring. Below here are detailed photographs of the bad itself from various angles. idea from Japanese magazine "friend No. 679". 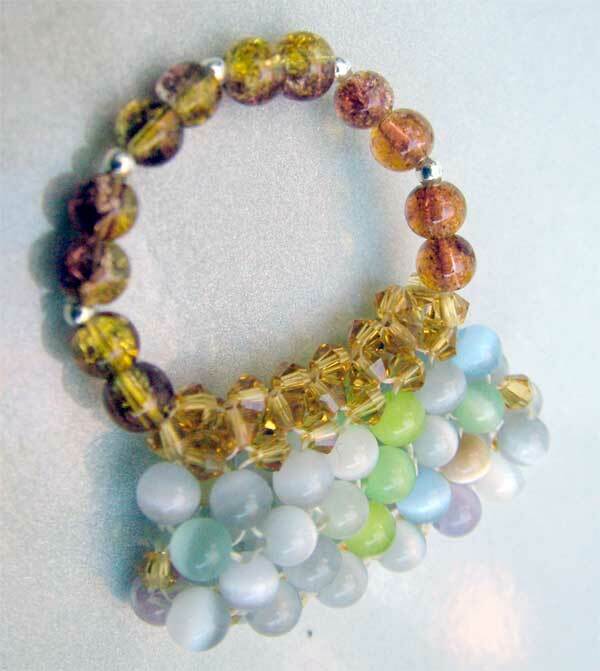 I made this beaded bag fashion accessory in the green tones of cat eye (fiber optic) beads topped with Czech crystals. It pays tribute to Nature's springtime renewals while combining just enough sophistication so that Barbie can enjoy her nights with casual elegance. 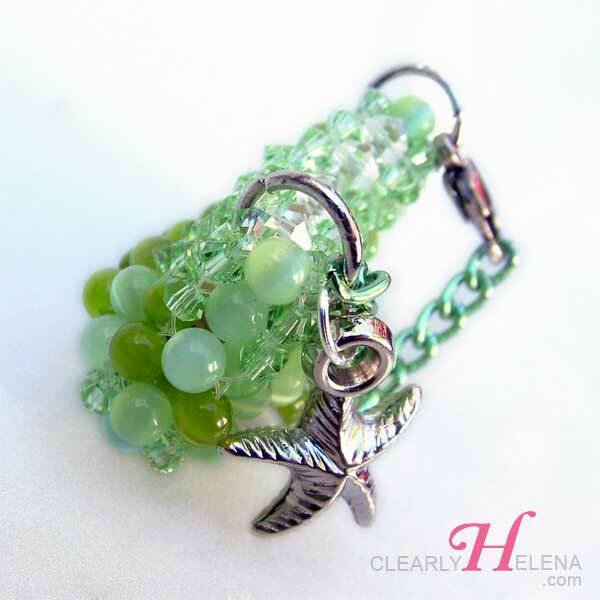 Beaded bag in a mix of lovely cat eye beads in hues of greens and matching Czech crystals beads. Little starfish charm for some extra nature's touch; hung from trendy green chain. Again I have made Barbie model for us to show how classy she looks with her new beaded baguette bag/fashion accessory. Remember always that a full size friendly human can, with minor modifications, convert this into a jeans fashion accessory, a bag charm, or even a key ring. 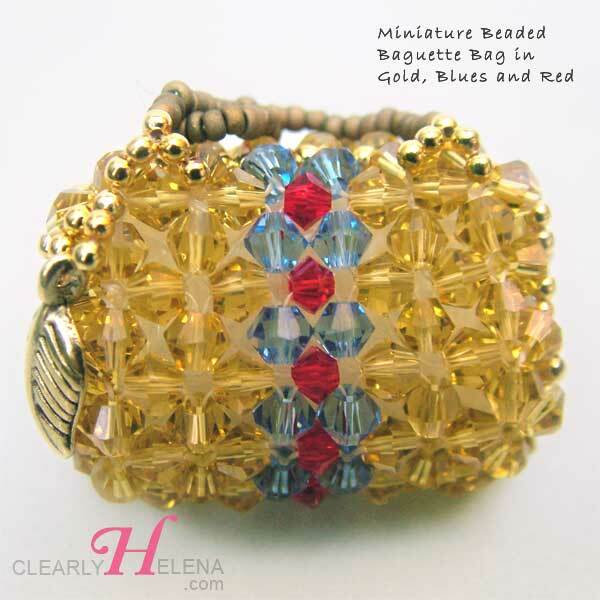 In fact, with this particular beaded bag, becuase of the integrated clasp and chain, you can easily attach it to jeans loops, handbag straps, and key rings. 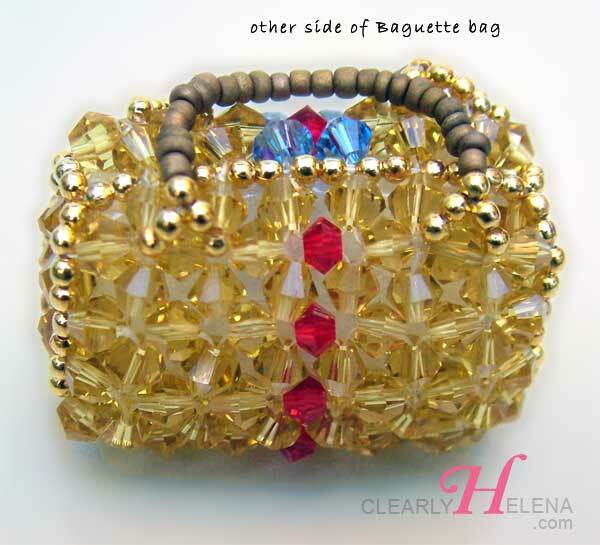 A classy yet cute miniature beaded bag done in Pale shades of cat eye (fiber glass) beads and Honey crackle glass beads. Ideal for your Barbie doll on her jaunts and carefree outings. 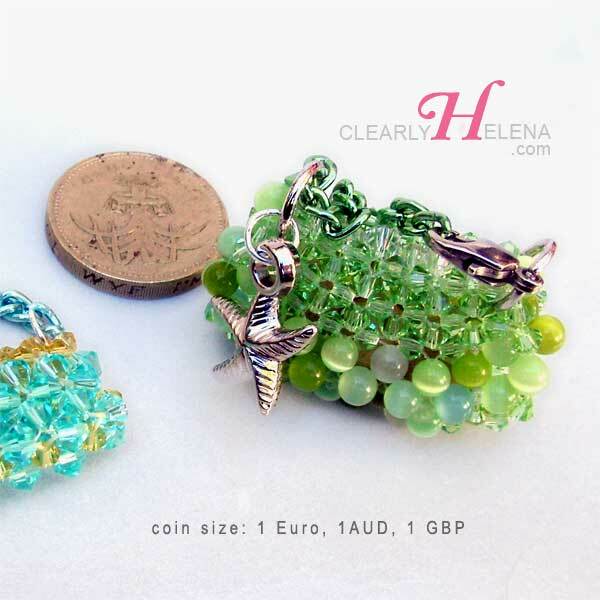 Can also be easily modify as a handbag charm or key ring charm or jeans accessory. Again we start off with Barbie doll modeling for us. Remember that a full size friendly human can, with minor modifications, convert this into a jeans fashion accessory, a bag charm, or even a key ring.